From the slight raise of an eyebrow to a playful pout of the mouth, people often speak volumes without saying a word. At any moment, on any given day, the average person engages some of the 43 muscles in the human face in various combinations to display up to 21 expressions. Whether purposeful or subconscious, these forms of nonverbal communication help convey emotion. 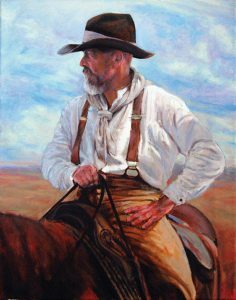 They are also as essential to creating a successful portrait as the interaction between subject and artist. Members of the Maryland Society of Portrait Painters (MSPP) claim portraiture to be the most challenging art form to pursue because people demand a certain level of resemblance. Joanna Barnum, Generations, 15x 22, watercolor, 2017. Created for MSPP’s exhibit “Face-to-Face: The Evolving Story of Sandy Spring”, Sandy Spring Museum: a portrait of two residents of Sandy Spring who volunteered to participate in the collaboration. While there’s no question that the human face is as fascinating as it is ubiquitous, its universal appeal is debatable. Lacking a familiarity with the visage staring back at you or the notoriety of the creator behind it, one might not have reason to linger and look at a portrait. MSPP recognizes that and understands the personal nature of portraiture, and kept it in mind when assembling this past summer’s exhibit at the Willow Gallery in Quiet Waters Park. Unlike previous shows it’s coordinated, the all-members collection of 88 paintings, drawings, and sculptures, by 34 different artists, added landscape and still life pieces to make it accessible to a wider audience. Broadening the showcase’s scope benefitted the novice MSPP members by giving them an opportunity to step into the spotlight. Lawton—who joined the volunteer-run, nonprofit organization a decade ago and has been its president for the past six years—said he had to convince some of his less-confident colleagues to submit work. “Everyone has talent and ability, it’s just a matter of whether it’s developed or not,” he says. For him, each subject matter builds on another. Landscapes require decisiveness, forcing the painters to react to what they’re seeing in real time. Still life offers more control of the material, lighting, and time. Portraiture combines those skillsets, yet also necessitates drawing expertise. Exhibiting finished artwork is considered the final step in the artistic production process. The range of proficiency among the MSPP’s current 100 members might vary, but they have one thing in common, and that is documenting all aspects of life, says Andrée Tullier. The painting instructor serves as MSPP’s membership and accreditation chair. Like some of her peers, she also works as a full-time professional artist; other members include part-time artists, retirees, students, and hobbyists. “We’re not just a portrait community, we’re an art community,” says Tullier. Melissa Gryder – Paps, oil, 24×18. This portrait of the artist’s grandfather is the first in a series of portraits of Maryland farmers. The project entitled “Farm Crisis” is meant to bring attention to the dying tradition of family farms in Maryland. 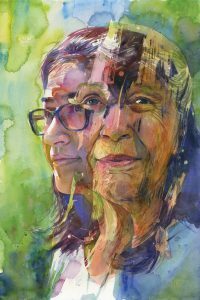 Rose Frantzen, a nationally renowned artist, painted a portrait from life as part of the Society’s annual meeting. Portrait of Maquoketa, Rose’s solo project of 180 portraits of the people of Maquoketa, Iowa, was exhibited at the Smithsonian’s National Portrait Gallery in Washington, D.C. in 2009/2010. Pamela Wilde – Peter, 12×12, oil. This painting is one of many that she has painted since January. 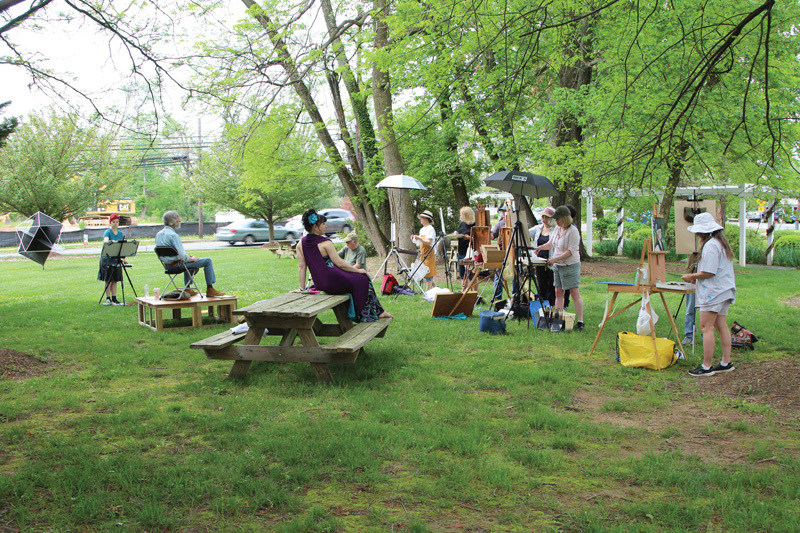 All are created in a live 3-hour Alla Prima session as part of her “Portraits from Havre De Grace” community art project. Members of the community and beyond have been invited to participate. To date Pamela has completed 35 paintings and hopes to complete up to 100 before the exhibit opens. Her portraits will be on display at Artists Emporium Gallery 220 N Washington Street HDG, MD 21078 in the Spring of 2019. Andrée Tullier – Ahren Buccheister, pastel, 16×12. Muscians of Annapolis project. Joanna Barnum, MSPP Accredited Member, watercolor artist, Abingdon, MD. Error: Error validating access token: Session has expired on Saturday, 09-Mar-19 15:57:50 PST. The current time is Tuesday, 23-Apr-19 09:33:06 PDT.